Hello guys, enjoy Red Cheetah free 1GB of data when you follow the steps am going to reveal to you here. Unfortunately, this awoof 1Gb is not available for Everyone But you might Get lucky just like me and get your own 1GB free Data to Browse, Stream and Download. In fact, to some people, Red Cheetah sent the message straight to the beneficiaries to download the app to get the 1GB free Data. In other words, you can get a message from them too if you did not then just follow the short step I'd be outlining below. Look for an ad On this blog Advertising the Red Cheetah App - Enjoy free BroadBand Wi-Fi, Free Broadband Internet (when you find it (you can see it above) click on it to download/Install the Red cheetah app, it will redirect you to play store where you will download the app, do not download the app from any external site else you won't get the free 1GB data, you can also CLICK HERE TO DOWNLOAD THE APP DIRECTLY from play store (Recommended). After you Must have download and install the App, open the app and make sure your Wi-Fi is also on and you are in a place/area where you don't have issues with network. 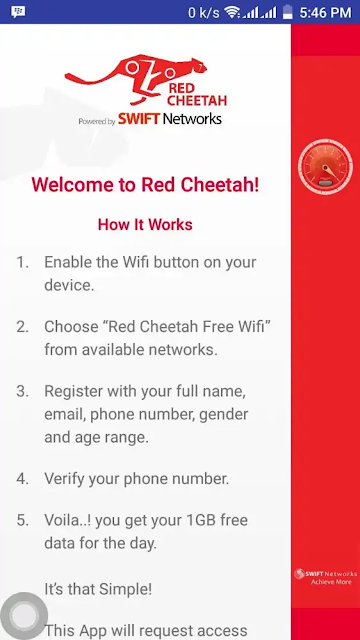 After your Wi-Fi is on search and download the Red Cheetah Free Wi-Fi from the drop-down or listen of available Wi-Fi networks you searched. Immediately after verification you will get the 1GB free data to browse, download and stream just like me. So easy right? Note: the Downloaded app will request for access make sure to allow access else you won't get the 1GB free data, of you have any issues please kindly use the comment box I will answer all questions asap. 4 Responses to "HOT! How to get free 1Gb Data on your Phone Now From Red Cheetah - Works for all SIM"
I'd need your feed back. i am glad you did get yours, kindly share with friends.